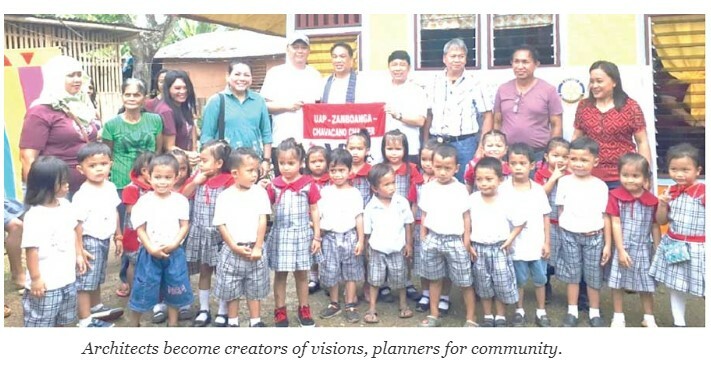 One of the fascinating and heart-warming works of the architectural profession is when the organization or chapters of the United Architects of the Philippines (UAP) bond together to perform a corporate social responsibility (CSR) project to benefit a certain community or the society at large. These CSR projects are so touching they have even transformed the lives of those who reached out and served the society. There have been so many of these notable CSR projects by architects as such is their way of returning the favor to the community. In the process of doing these pro bono services, the architect’s creativity, ingenuity and resources are tapped and shared. As the saying goes, it’s in giving that one receives. True enough, in the various social responsibilities the architect does to elevate the plight of the less fortunate, he gains the respect of the community, satisfies his desire to serve more. He realizes that he’s instrumental in shaping the thinking of others especially the beneficiaries. He expresses his art forms into solid structures worthy of habitation and the purpose to which the project structure or building is intended for. There have been several CSR projects the UAP National, including its various chapters, has done to uplift the lives of their beneficiaries. Worth mentioning are the rehabilitation of Marawi school complexes UAP is doing now in partnership with TV networks channel 2 and channel 7, the “Libro ko, libro mo” CSR project of UAP Hamili chapter in the mountainous Panay region, the GRACES Home for the Elderly project of UAP with “Failon Ngayon,” and the scholarship programs implemented. Last August 5, I, together with some national officers, chapter officers and members of UAP Zamboanga Chavacano chapter led by their president Arch. Mark Jerome Gandarosa and immediate past president Ramil Marba, attended the ribbon-cutting and turnover ceremonies of a Child Development Center (Daycare Center) in one of the depressed areas, the Mercedes Village, in Zamboanga City. The occasion was also attended by the Rotary Club of Metro Zamboanga members whose immediate past president Lydia Lubaton was instrumental in initiating the project, which UAP Zamboanga Chavacano chapter adopted as a CSR undertaking. It was a good idea for the Rotarians to collaborate with architects as they trust their designs and plans. Much more, they tapped the architects because they truly know and appreciate their value in building designs, environmental concerns and other government initiatives. The affair was also graced by representatives of the DSWD and local barangay (village) officials and all the beneficiaries in that depressed community. Truly, it was a heart-warming and touching moment as young children danced with joy and thanked all those who participated in the project. It sent tears of joy to all of us attending the affair, including parents in the community. Architects come to realize they are not only the prime professionals in the design-built environment, but they are even more than that. They are creators of visions, planners for a community, implementers of creative ideas, users of indigenous materials found in the locality, promoters of building construction and methodology, adaptive partners with friends in the industry and with other professional or social groups and movers of change that unifies the community to improve lives. The Child Development Center of this community is quite a disaster-resilient structure using indigenous materials found in the locality. It’s well ventilated, architecturally done and its basic amenities are far more improved than the daycare center beside it. It is conducive for learning. 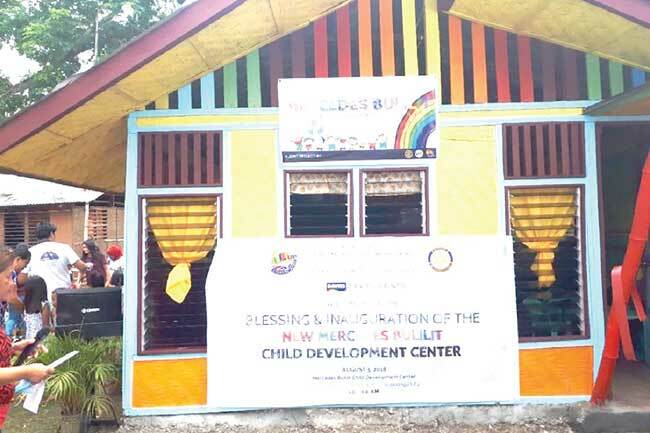 Friends in the industry such as Davies Paints stepped forward to help the Rotary Club of Metro Zamboanga and the UAP Zamboanga Chavacano chapter partner build the daycare building. They contributed lively colors of assorted paints to welcome young kids as they walk to the beautiful learning facility. The world changed for the better in this small part of Zamboanga when a group of professionals and the business sector put their time, efforts and resources together, just like when Zamboangeños bonded together to rehabilitate their beloved city after the siege a few years back. Look where this vibrant, bustling city is now. The people are united because of one goal inspired by the active and energetic mayor Ma. Isabel Climaco-Salazar.